Samlex sine wave inverters offer a low-cost, high-quality small sine wave inverter for remote homes, RVs and boats. The 120 VAC output is overload protected. All of these inverters have AC receptacles and low-battery alarms. If you plan to use these inverters with reactive loads, such as motors and compact fluorescent lights or other ballasted light, size the inverter for 4 times the continuous watts required. ETL Listed to UL458. Each inverter includes a 2-year warranty. 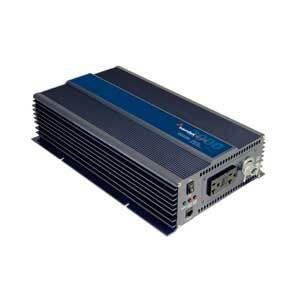 These inverters convert DC battery voltage to AC voltage with an RMS (Root Mean Square) value of 120 VAC, 60 Hz RMS. The waveform of the AC voltage is a pure sine wave form that is same as the waveform of grid power. The term RMS (Root Mean Square) applies to voltage and current (amps) measurements. UPC – Universal Protection Circuit: low voltage, over voltage, over temperature, over load and short circuit. Samlex PST-2000-24 inverters ship in about 10 business days after funds clear. Samlex, PST-2000-24 Inverter Charger will change the direct current (DC) power from stored energy in batteries, and convert it into alternating current (AC) electricity that home, RV or Marine owners can use to power electronics that are rated within the inverters continous watts output. 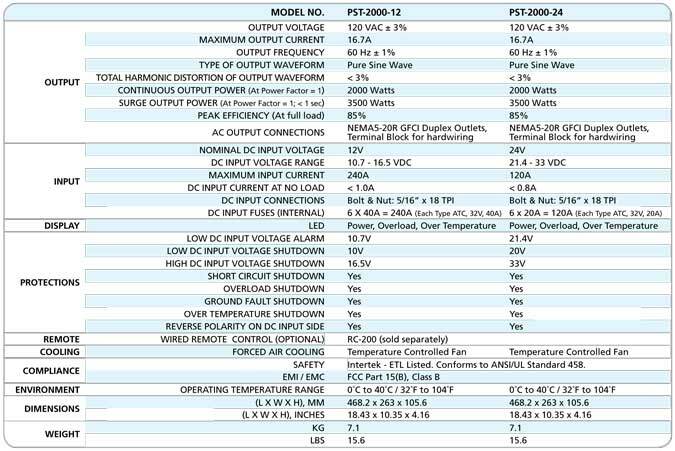 To evaluate your power requirements look at the name plate of the largest electronic appliance you want to run then look at the watt and surge rating of the Samlex, PST-2000-24. Your inverters consistent power capacity and surge capacity should allow a + 25% calculation safety factor when measured against the highest energy demand of your appliance. IMPORTANT SAFETY INSTRUCTIONS: It is the responsibility of the purchaser to ensure that all products are installed and operated in accordance with local and national building codes as specific by the NEC (National Electric Code), UBC (Uniform Building Code) or IBC (International Building Code) and local utility company policy. This product is designed for indoor or protected compartment installations. DO NOT expose the inverter to rain, snow, moisture or liquids of any type. Use insulated tools to reduce the chance of electrical shock or accidental short circuits. Remove all jewelry such as rings, watches, bracelets, etc. when installing the Samlex inverter or any other electronic gear. Always disconnect the batteries or energy source prior to installation or performing maintenance on the Samlex, PST-2000-24 inverter. Live power may be present at more than one point since an inverter utilizes both batteries and AC electricity. Turning off the inverter may not reduce that risk. Always verify proper wiring prior to starting the inverter. 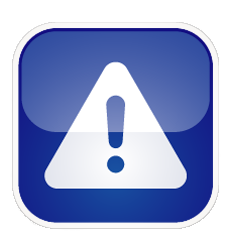 Do not operate the inverter if it has been damaged. Always read and follow the manufactures installation and operating instructions for the Samlex, PST-2000-24 inverter charger prior to installation and operation.